Growth was fleeting in 2012, especially in China and in other emerging markets. In Europe, a crisis turned into an outright recession, which at the close of the year still showed no signs of abating. In the United States, a typical business cycle recovery has yet to emerge in many sectors. Although U.S. gross domestic product (GDP) surpassed its pre-recession peak, growth was painfully slow in 2011 and 2012. The atmosphere in Washington about issues such as the "fiscal cliff" has undermined business confidence, impacting investments and hiring. Recent regional surveys and other indicators suggest the strong manufacturing recovery in the United States has lost momentum and factory activity has peaked, hopefully temporarily. Moreover, the recession in Europe and weakness in Asia is hindering export sales, a pillar of growth during 2009–2011. At this point, the consumer — bolstered by lower debt and the apparently sustainable recovery in housing — is taking over from the business sector in providing foundational support for the U.S. economy. One short-term indicator to watch is the Chemical Activity Barometer (CAB), which is a composite index of economic indicators that track the activity of the U.S. chemical industry (see: "How Will The U.S. Economy Fare?"). This activity generally occurs early in the supply chain, so the CAB provides a leading indicator for the overall economy and can reveal potential turning points. The CAB is signaling slow, tentative economic growth in early 2013. The consensus forecast (our base case scenario) for U.S. GDP is for continued but anemic growth in 2013 — about 2.0%, which is well below the long-term trend (Table 1). This presumes Washington avoided going over the fiscal cliff, which it hadn't done at press time. If so, economic growth should return to long-term trend levels in 2014. If not, the economy could shrink nearly 0.5% this year. Table 1. Growth will return to long-term levels in 2014. Many major end-use markets — especially those tied to exports and business investment — have recovered in the United States. However, others remain below their 2007 peaks. Growth in the manufacturing sector, which is the largest consumer of chemicals, abated in 2012 after gains from mid-2009 to 2011. The two-speed manufacturing sector that emerged in 2011 ("What Will 2012 Bring?") continues. Oil and gas, light vehicles and aircraft, as well as iron and steel remain strong. Light vehicles represent an important market for chemicals (nearly $3,650 per vehicle), and production continues to increase. U.S. light vehicle sales are expected to rise in 2013 and in 2014 as pent-up demand, improving employment (and income) prospects, and better availability of credit foster growth. Housing, another large consumer of chemicals (over $15,000 per start), shows very encouraging signs, and was perhaps the major economic news of 2012. Housing activity will start to stir in 2013 and 2014. Shortages have emerged in some local markets and prices have begun to rise nationwide. Moreover, demographic factors are re-emerging as a driving force. Activity will remain well below the previous peak of 2.07 million units in 2005 but by mid-decade will approach the long-term underlying demand of 1.5 million units per year as suggested by demographics and replacement needs. Overall, the spotty manufacturing recovery has dampened domestic chemical demand while the recession in Europe and weakness elsewhere have hindered exports. In general, inventories along the supply chain have become only slightly imbalanced and, barring a major recession, a large correction isn't expected. The weakness in exports to Europe and China has been partially offset by gains in other regions. Meanwhile, imports declined, as industrial demand weakened. In 2012, exports rose 1.8% to $190.2 billion while imports slipped 0.8% to $189.5 billion. Thus, the U.S. chemical industry enjoyed a modest trade surplus, a welcome reversal from 2011 when it suffered a deficit. Table 2. The U.S. chemical industry now enjoys a trade surplus and this will grow. Renewed competitiveness due to shale gas (and the resulting disconnect between U.S. natural gas prices and global oil prices) is prompting new investments — we count over 50 projects announced in the last two years, representing aggregate capital spending exceeding $40 billion — that will boost exports in the years ahead. The large surpluses in basic chemicals will continue to expand, as will surpluses in specialties and consumer products. These gains will more than offset continuing trade deficits in pharmaceuticals and agricultural chemicals, and result in growing trade surpluses. The consensus is that U.S chemical output will improve during 2013. Volume of chemicals, excluding pharmaceuticals, will increase 1.9% in 2013 and 2.3% in 2014. Strong growth is expected in plastic resins as export markets revive. Demand from end-use markets, most notably light vehicles and housing, will drive production of specialty chemicals. Gains in consumer products, which were strong last year, will moderate in 2013 and 2014. After a weak 2012, demand for agricultural chemicals will revive. In the long term, growth in U.S. chemicals will outpace that of the overall U.S. economy. Pharmaceuticals eventually will emerge as a growth segment. Although projected year-on-year growth rates for most segments during the next few years appear good, they must be considered in the context of the exceptionally sharp declines seen in 2008 and continuing into 2009. It may take years for activity to recover from these steep declines and exceed past peaks. Another factor is that these projections reflect the consensus; mainstream forecasters' models largely are demand-driven. The significant investment in shale gas is a supply-side response and suggests a much higher growth profile, as we'll discuss later. Thus, the consensus outlook likely is too low. The industry is sensitive to a number of risks. High and volatile energy costs are paramount in this regard, as are potential adverse regulatory and other policy initiatives. Fiscal squabbles in Washington could dampen domestic industrial activity, while an even weaker world economy would adversely affect exports. With a stalling of volumes, overall operating rates slipped during 2012. 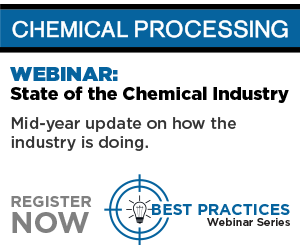 Looking forward, modest gains in chemical industry production volumes and stable capacity suggest improving operating rates this year; strengthening production volumes could boost capacity utilization even higher in 2014 and beyond. The more than 50 projects already announced will result in fairly strong gains in capacity through 2017. U.S. investments in chemicals surged 19.8% in 2011. These gains continued into 2012; capital spending grew 15.5% to about $38.1 billion last year. Capital spending cycles generally lag cycles of industry activity — profits and operating rates serve as leading determinants of spending. (Other factors influencing the level of investment include the business cycle, long-term business expectations, taxation policies, the cost of capital, the burden of debt, the supply of credit, and mandated expenditures, e.g., due to regulations.) In general, improving production and utilization rates, cost containment from earlier cost-reduction efforts, low feedstock and other raw material costs (compared to Europe and Northeast Asia) and higher selling prices resulted in a strong recovery of profits from 2010 into 2012. Given the new dynamics from shale gas, the current upswing in profits possibly will last longer than in recent cycles. In addition, utilization rates have risen, although they remain below the levels of several years ago and the long-term average. With improving operating rates and profit margins, and a low cost of capital, the U.S. chemical industry will increase investment in new plant and equipment. The need to replace worn-out and outdated assets is apparent and will spur some spending. However, improved U.S. competitiveness resulting from shale gas will be the most important driver. The industry's investment cycle clearly has re-engaged; capital spending quickly has surpassed the most recent peak. The recovery will strengthen into an expansion by mid-decade, with greater capital spending for capacity additions expected during the next five years. Thanks to shale gas, the United States is becoming an increasingly preferred location for plants. Substantial new investments in petrochemicals and derivatives will arise from shale gas developments. Basic olefins capacity will increase by 35% to 40%, various industry consultants estimate. Double-digit gains are expected through 2015 with only a minor slowdown in capital spending after that. By 2017, capital spending by the U.S. chemical industry will reach $64.5 billion, more than double the level at the start of this decade. The availability of gas from shale is possibly the most important domestic energy development of the past 50 years. Following a decade of high and volatile natural gas prices that destroyed industrial demand and led to the closure of many gas-intensive manufacturers, shale gas offers a new era of American competitiveness that will lead to greater investment, industry growth and employment. Increasing domestic shale gas production is helping to reduce U.S. natural gas prices and create a more stable supply of natural gas for fuel and power. It also is leading to more-affordable supplies of natural gas liquids (NGLs), including ethane, which is a key petrochemical feedstock. As we've already noted, U.S. chemical makers have announced more than 50 projects in the past two years to capitalize on the competitive advantage of abundant supplies of natural gas and NGLs. Such projects include new ethylene crackers as well as units for derivative products (i.e., polyethylene, ethylene oxide, etc. ), methanol, ammonia and on-purpose ethylene co-products. To illustrate the potential of these investments, Figure 1 shows ACC's estimates of the incremental production from the 50 projects (in orange) overlaid on top of our baseline forecast (blue). Including production from new investments, growth likely will average 4.6% per year through 2017, more than double the 2.2% average annual growth of the consensus forecast. Figure 1. New plants spurred by shale gas will boost production of chemicals excluding pharmaceuticals. Following a decade of job losses, the chemical industry added jobs for the second year in a row in 2012. Total employment rose to 798,500, up 1.3% from 2011. This in large part reflects increasing production of comparatively more-labor-intensive plastic resins, synthetic rubbers and manmade fibers. In 2013, productivity gains, which typically average around 2.5% per year, will outpace output growth. Thus, employment will slip by 0.2% this year before expanding by 0.8% in 2014. However, the graying manufacturing workforce and decades of young people turning away from careers in manufacturing and the trades raise concerns about the quality and quantity of workers that will be available. Government and industry likely will work together to ensure the American workforce is prepared for the jobs required in an emerging manufacturing renaissance. Moreover, the retirements of baby boomers — the average age of a chemical industry employee is over 50 — present challenges for retaining institutional knowledge. Today, many companies are ratcheting up efforts to avoid knowledge and skill losses (see: "Keep Know-how in Place"). They increasingly are using information technology and other media to capture and store institutional knowledge, and transferring that knowledge via project debriefings, mentoring, communities of practice, etc. In addition, they're taking deliberate steps in career development and succession planning, and employing phased retirements, etc. Fortunately, the supply of new chemical engineers is on the upswing. After declining in the mid-2000s, chemical engineering enrollments now are increasing, somewhat alleviating what could be a critical challenge. Greater cooperation between industry and academia is playing a role. The global recovery stalled in 2012 with Europe slipping back into recession and manufacturing in China slowing sharply. In the U.S., uncertainty about the election, the fiscal cliff, and the overall pace of recovery curbed growth. More than three years since the official end of the recession, the majority of manufacturing industries remain below their pre-recession peak. However, while growth slowed in developed countries, emerging market economies continued to expand. This year, growth will accelerate across most regions of the world. Low-cost shale gas will enable U.S. chemical makers to emerge as global low-cost suppliers of many petrochemical and plastic products. As balance sheets continue to improve and the nation's shale resources are developed further, chemical producers and other manufacturers are bringing investment back to the U.S. This manufacturing renaissance offers huge potential, not only to the millions of American workers it will employ, but also to the U.S. economy as a whole. THOMAS KEVIN SWIFT is chief economist and managing director of the American Chemistry Council, Washington, D.C. MARTHA GILCHRIST MOORE is senior director, policy analysis and economics, for the American Chemistry Council. E-mail them at Kevin_Swift@americanchemistry.com and Martha_Moore@americanchemistry.com. Production should grow moderately in 2015 and for the next several years. Switching to the fuel may make sense even for sites far from pipelines. Some companies are taking proactive steps to retain knowledge.